Hamsters, particularly the tiny varieties referred to as dwarf hamsters, are well-known escape artists. Whether squeezing through seemingly impossible cracks or chewing their way to freedom, dwarf hamsters good at being on the outside of their cages looking anywhere but in. 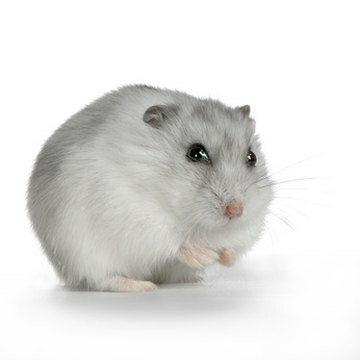 Take steps to ensure that your dwarf hamster remains safely in her cage. Select an appropriate cage for your dwarf hamster. Wire cages are not suitable for dwarfs since hamsters of all but the largest so-called dwarf varieties can fit their heads between the bars. Wedging the head between bars can cause injury and is a common cause of non-natural hamster deaths. Instead, look for an aquarium with a well-ventilated wire top, or an enclosed solid plastic cage. Check the exterior of the enclosure, particularly around any doors, tubes or tunnels, looking for any gap large enough for a dwarf hamster to squeeze through. Any gap larger than a half centimeter, one-fifth of an inch, is large enough for a dwarf hamster to fit through. Cover, patch or narrow any gaps you encounter. Make sure your dwarf hamster enclosure has no materials your hamster can chew through. These include wood, thin plastic or thin screen. Eliminate these materials if possible, or reinforce them with sturdier materials. Watch your hamster carefully when you introduce her to her enclosure, and observe her periodically as she begins to acclimatize to her cage over the subsequent few days. Notice any areas she tries to chew or squeeze through, and check carefully for any new holes or chewed areas when you clean her cage. Patch or reinforce these areas. Remove any cage accessories tall enough to allow your hamster to climb to the top of the cage. Allow such accessories in the cage only when you're supervising your hamster.  If all else fails and your dwarf hamster keeps escaping, you can place the enclosure completely in a clear, high-walled smooth plastic storage container, topped with a screen. This will provide an extra level of security and ensure that even if the hamster escapes her cage she remains contained.